This is a sponsored post written by me on behalf of GameStop®. All opinions are 100% mine. 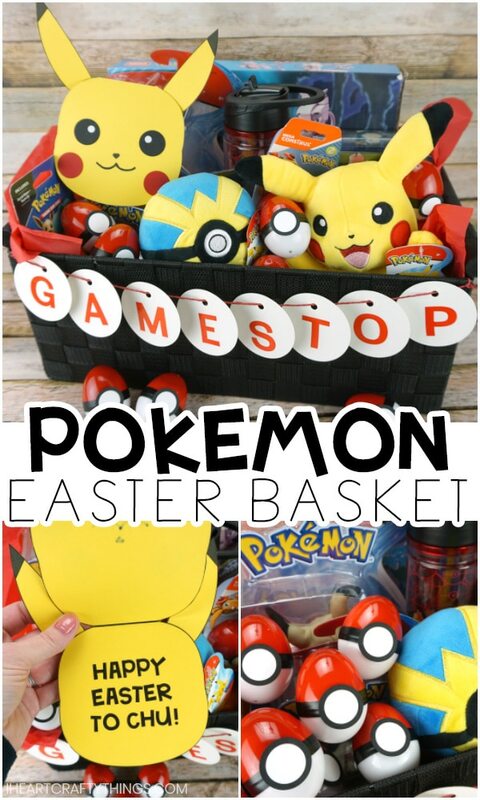 We hope you have fun building your own Pokemon Easter Basket for your children this year. My kids have had a long standing love for all things Pokemon for a couple years now. In fact, their appreciation for Pokemon cards inspired me to start my very own collection, so I guess that makes Pokemon a family affair in my home. Building a Pokemon Easter basket this year for my kids was an obvious choice. Sometimes I find it difficult to find something for each of my children based on the same theme because they are such different ages. GameStop solved that problem for me this year because they have a huge variety of games, consoles, accessories, toys and apparel for all ages. 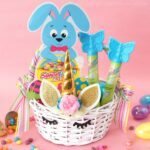 They are a one-stop shop for gathering all of the Easter basket fillers and stuffers on your list. 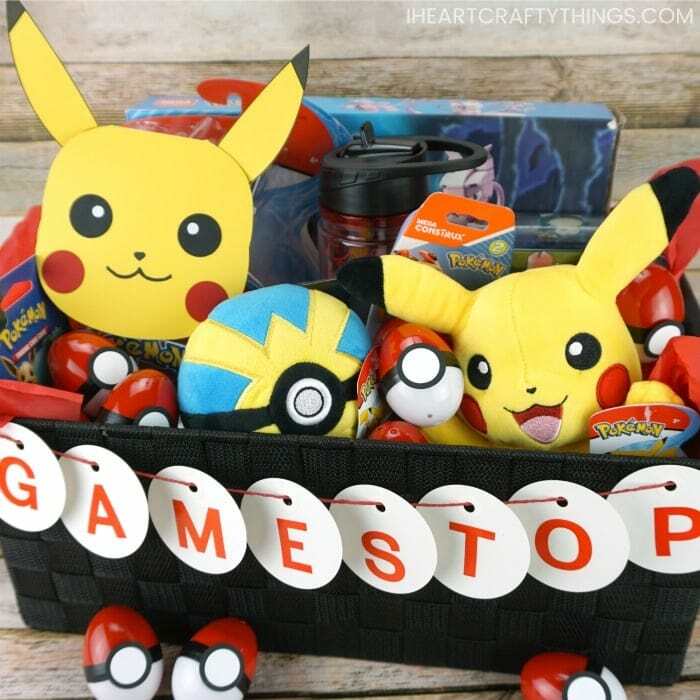 While we went with a Pokemon theme this year for our Easter gift, GameStop has something in all sorts of themes to delight the gamer in your life. Right now they have an awesome spring sales event going on from April 7 through April 20 with some amazing deals you won’t want to miss. If you have Pokemon and Pikachu fans in your house, they are going to jump for joy over receiving a Pokemon themed Easter basket this year. 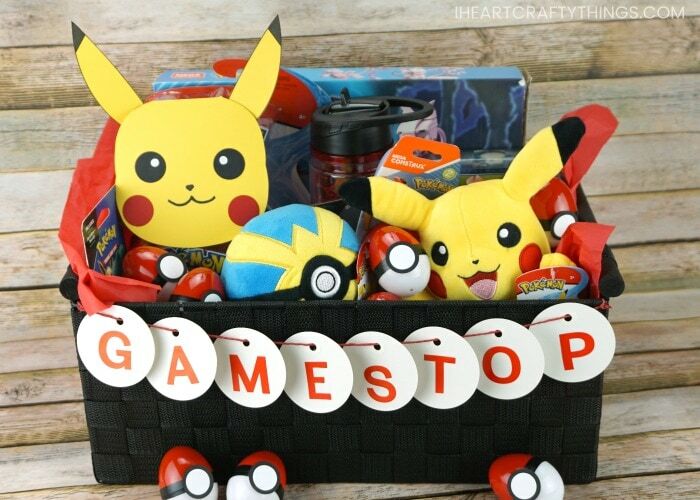 Start with a quick trip to your local GameStop, or visit their store online, to find your favorite Pokemon toys, games and accessories to use for an Easter basket filler. You can see a small glimpse in these pictures of some of the fun toys and accessories you can find at GameStop. 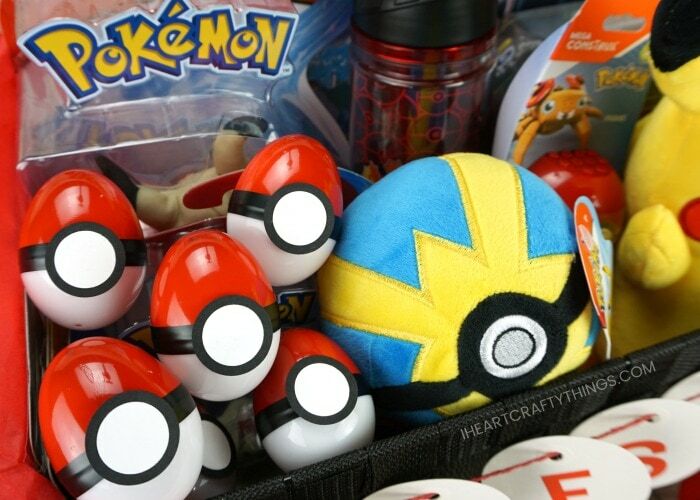 They have Pokeball plushies, Pikachu plushies and other Pokemon toys and games that are perfect for kids. My daughter is going to especially love building the MewTwo MEGA™ Construx set. They have great options for older children and tweens as well like Pokemon card tins, water bottles, keychains, wallets, patterned socks and more. Can we talk about how amazing these Pikachu slippers are?! Pikachu’s cheeks light up when you walk in them. I added them to my own personal wish list because they are so adorable. While you are out, purchase a TV console organization basket to use for your Easter basket. It will be great for helping organize video games and accessories after Easter. An Easter basket is not complete without some sort of crafty homemade element to it, so I added a fun Pikachu Easter card to our basket, along with some DIY Pokeball Easter eggs. Let me show you how easy they are to create! Kids will adore this cute Pikachu card inside their basket. Our handy free template makes it especially easy for anyone to put together in a matter of minutes. 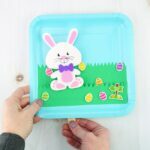 Our template has an Easter version that says “Happy Easter to Chu!” inside and we also have a blank version for you to write your own message, or to use for any time of the year. To make your own Pikachu card, download and print out the free card template on yellow cardstock paper. Cut out each of the pieces of the template. Fold the card template in half along the line in the middle of the card. 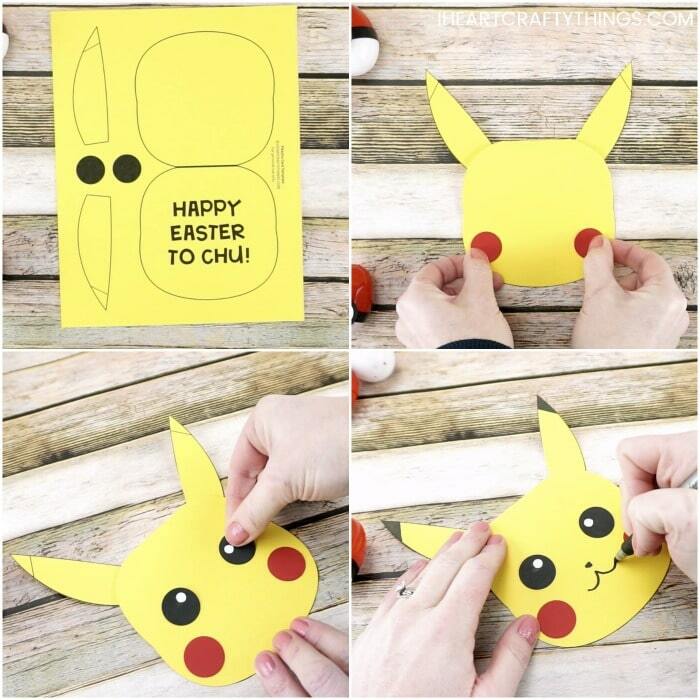 Use a glue stick to attach Pikachu’s ears on the back of the card. Cut out red one-inch circles for rosy cheeks and glue them on the front of your card. You can also use a red marker or crayon for this step. Glue the black circle eyes on Pikachu. Use a hole punch to punch two white circles out of paper and glue them inside the eyes for pupils. Finish your Pikachu card by using a black marker to fill in the tips of Pikachu’s ears, and then draw a nose and smile on him. Now let’s make some Pokeball eggs. 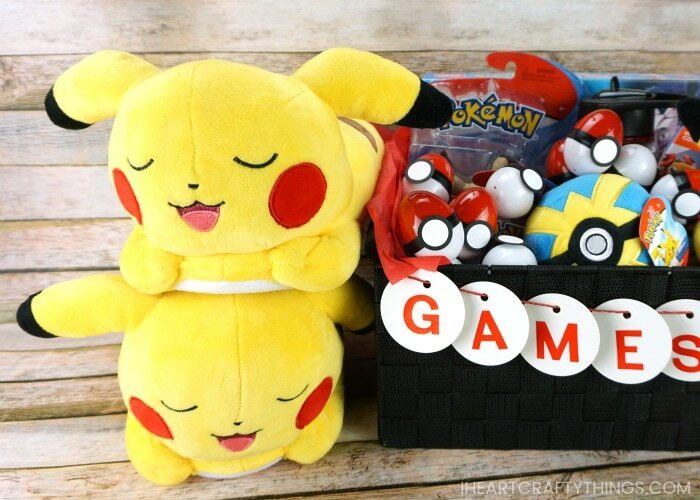 These Pokeball Easter eggs are a must for your Pokemon Easter basket. They are super colorful and surprisingly easy to make out of plain white plastic Easter eggs. To make your Pokeball Easter eggs, separate the tops and bottoms of your plastic white eggs. Take the Easter egg tops outside in a well ventilated area and paint them with bright red spray paint. Let them dry completely. When your egg tops are finished drying, bring them inside to reconnect with the white bottoms. Fill your eggs with your kids’ favorite Easter candy and close each of the Easter eggs. Cut off a section of black electrical tape and wrap it around the center of the egg. You may need to trim your tape in half if it is too wide for your eggs. To make the Pokeball release button, cut out a one-inch black circle and a three-quarter inch white circle. Glue the white circle in the center of the black circle. 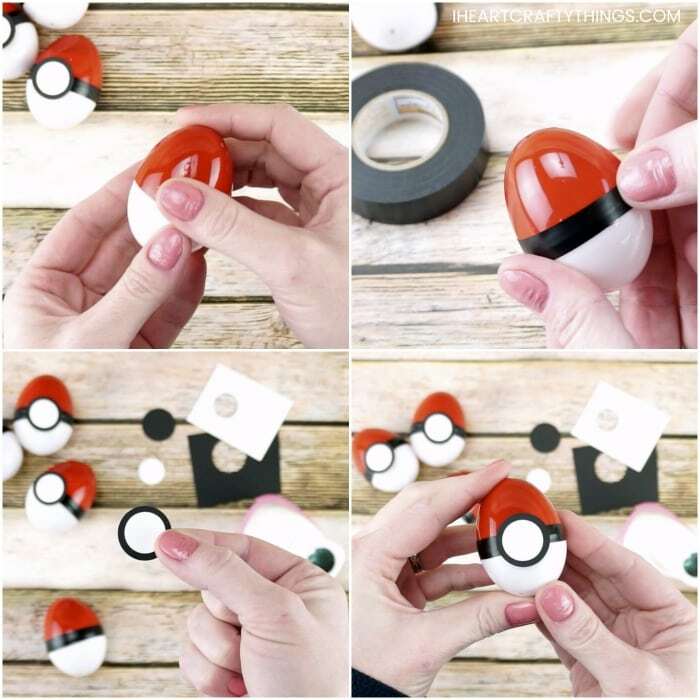 Then use glue dots to attach the button to the front of the Pokeball egg. 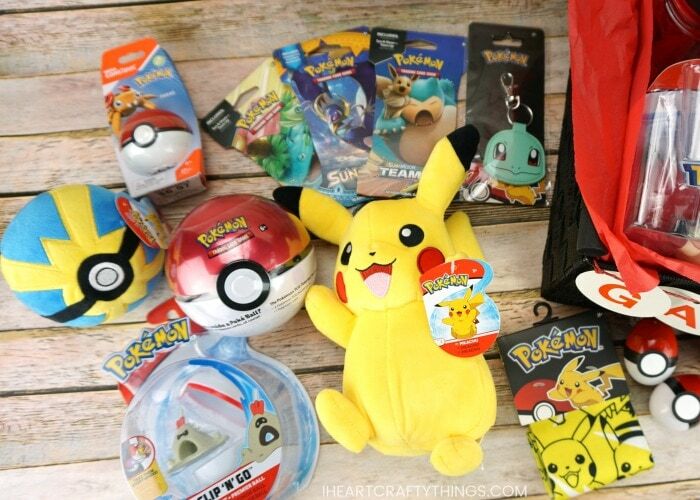 Now that you have all of your Pokemon basket stuffers, your Pikachu card and Pokeball Easter eggs ready, it’s time to put them all together to create your Pokemon themed Easter basket. 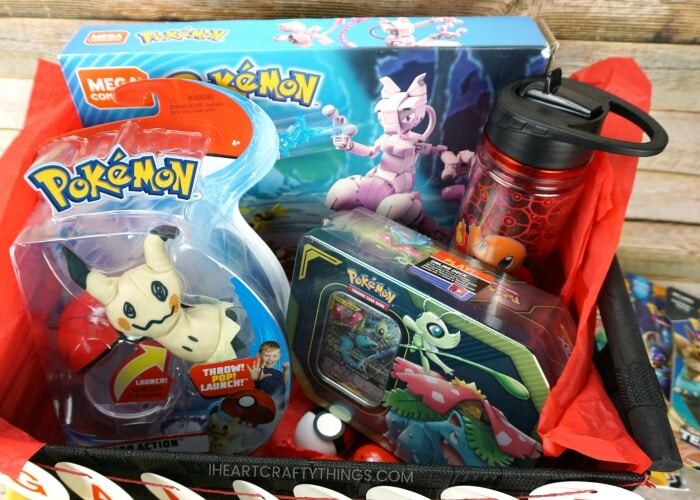 Layer some red tissue paper on the inside of your basket and then place the Pokemon toys, games and accessories inside the basket. 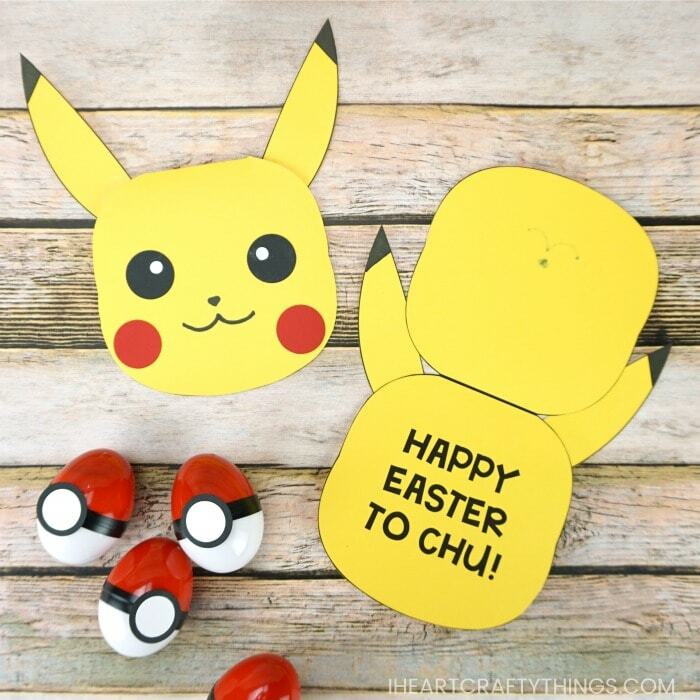 Finish your Easter basket by adding Pokeball Easter eggs around the top and adding your DIY Pikachu Easter card to the basket. Make sure you head to GameStop this week to take advantage of their spring sale and to get all of your last minute Easter basket fillers and stuffers. To get the latest news on video gaming and gear, follow GameStop on Twitter, Facebook, Instagram and YouTube. 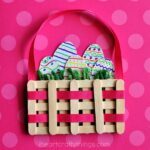 Looking for fun Easter crafts and activities to make with your kids? 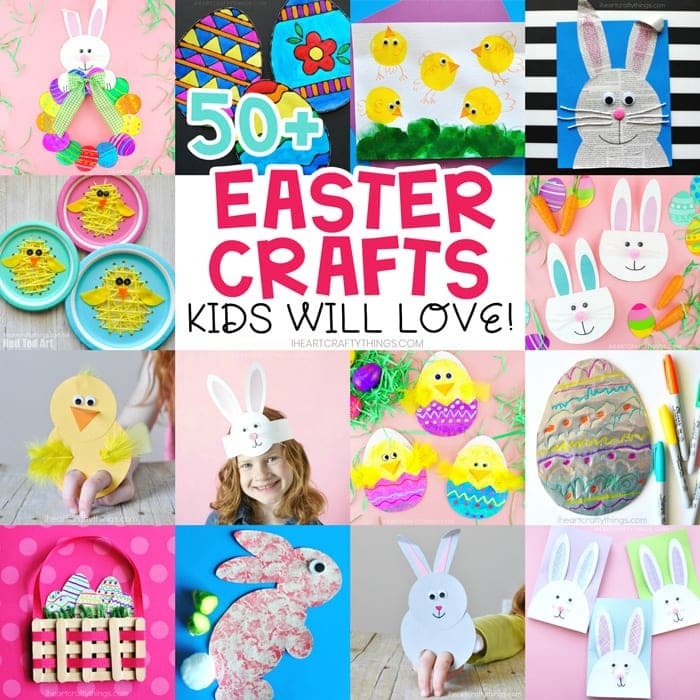 Check out this list of over 50 of the best Easter crafts for kids.